The Fall Classic has pushed Halloween to the back burner this year but there are still some great last-minute costume ideas that fans stricken with Phillies fever can toss together. 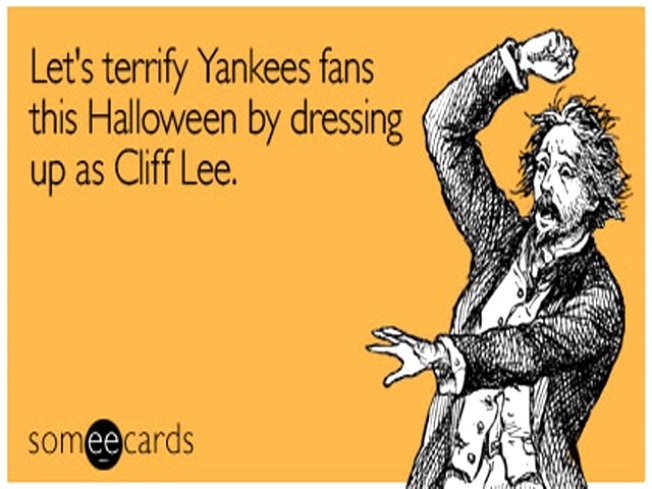 Phils fans can dress like Game 1 hero Cliff Lee to “terrify Yankees fans this Halloween,” according to the guys at SomeeCards. This LeeCard (get it) is not only hilarious but offers a really good costume idea. Here is how to pull it off. Just buy a Cliff Lee Phils jersey, wear a Phillies hat, grab a baseball glove and pop a big wad of gum into your mouth. Then walk around making nonchalant movements with the glove and you will looks just like Cliff Lee. The best part is that you might win scariest costume idea if you go to a Halloween party hosted by Yankee fans. “I could also say I had nightmares about Cliff Lee last night,” said SomeeCards founder -- and Yankee enthusiast -- Brook Lundy. But, there are some other fun ideas out there -- all of which should scare Yankees fans afraid of their team losing to the Phillies. 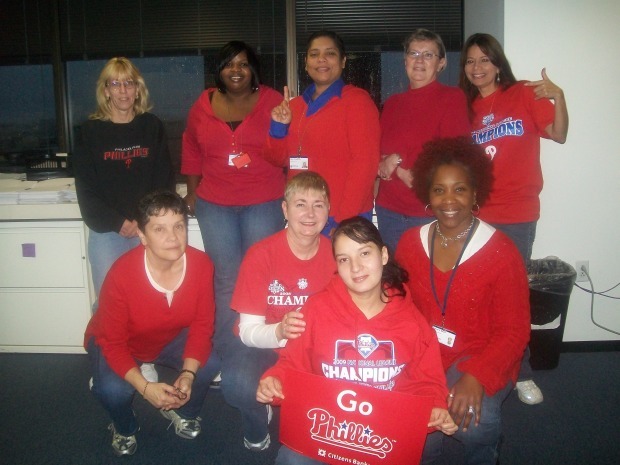 The ladies can dress up like a Phillies Ballgirl. For this one all you will need is a kid’s-size Phils jersey, short Phillies shorts, high baseball socks and maybe a little eye-black for effect. For fans looking to be “green” this Halloween while rooting on their Phils try a Phillie Phanatic mask. Some of these actually exist (and they’re quite terrifying) -- maybe one can be nabbed at a yard sale or thrift store this weekend. If you’re a bit artistic you could easily make your own using some green, blue and red fabric, some construction paper and a Phillies hat. And, don’t worry, your pets can also get in the act. You can make a small Phillies shirt for them or maybe purchase some baby gear at a local store and cut the shirts down to size. Our favorite costume idea this Halloween is to go out Saturday dressed as a Phillies fan. It isn’t the most creative or unique idea but you know you will be among friends in the City of Brotherly Love as you all cheer on the Phightins in Game 3.